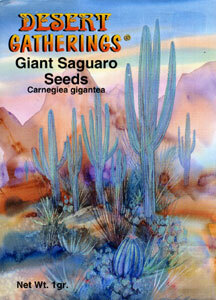 The Saguaro is what comes to mind when most people think of the Arizona Desert. Well-equipped for the desert climate, these cacti can live for over two and a half centuries and grow more than 70 feet high. The yellow-white bloom is the Arizona State Flower. The package comes with detailed sowing and care instructions, as well as an additional insert inside the package.